It may not seem that important in the whole scheme of things, but when Rolex decide to up the size of one of their watches, particularly one of their greatest hits, it’s actually a pretty big deal. The trend for larger watches has been gathering pace since the late 90s. Before then, pieces in the 37mm-40mm range were the norm, with the occasional outlier sneaking in that broke the self-imposed barrier, but these were generally sports models for a specific niche audience. What started as a fad at the beginning of the new millennium has since become the accepted standard, and these days, models that would have been seen as outrageously oversized a few short decades ago are now perfectly conventional. Rolex has shown the most resistance to the movement, stubbornly refusing to add even a single extra millimeter to legendary names such as the Submariner or the GMT-Master—professional models that have kept their dimensions unchanged for generations. However, even the most successful watchmaker in history has had to make some concessions to modern times and their most recently released models have all conspicuously grown up. So, we now have a 41mm Datejust and a 40mm President. The flagship Sky-Dweller comes in at 42mm, while the gargantuan Yacht-Master II and the kraken-like Deepsea both top out at 44mm. At last year’s Baselworld Fair, Rolex surprised everyone. It was well-known that a 50th anniversary edition of the brand’s iconic Sea-Dweller was on the cards, but what they unveiled was an all-new model that had grown from its 40mm origins to 43mm, leaving it within a hair of its even bigger bigger brother. It was a fascinating departure for the watch that has always sat in the middle of the dive trio but, with the benefit of hindsight, possibly one we should have been expecting. Rolex have taken steps to differentiate the Sea-Dweller from the ever-present Submariner all the way throughout its production run. While they most certainly share significant portions of their DNA, the Sea-Dweller has long been the more mature, seriously-minded of the two. It was the watch that introduced the Helium Escape Valve, a vital addition that allows expanding gas bubbles to escape from the interior without damaging the crystal. Until last year, it may have had the same diameter as the Sub, but it has also always had a thicker, more robust case to grant it its deeper depth rating. And it has never succumbed to the allure of precious metals in its construction, unlike its smaller sibling. So giving it bigger dimensions to help separate them even more, as well as fit in with contemporary fashions, was a double benefit. But it leaves us with almost two different watches—the 40mm and 43mm Sea-Dwellers. Below, we’ll take a look at both. The Submariner had already been around for over a decade before the need for anything more than its 300m of water resistance surfaced. By the mid-sixties, professional saturation divers were routinely working at great depths, sometimes living in underwater chambers for days or weeks at a time. Before their immersion times were tracked and regulated by the highly precise monitoring systems common today, a reliable watch was absolutely paramount. One of the world’s biggest commercial diving operations, a French company named COMEX (Compagnie Maritime d’Expertises) approached Rolex in a bid to create a watch that could not only withstand the crushing pressures its crews were working at, but would also survive the ascent back to the surface. At depths below 30m, breathing gases start to behave differently than they do at sea level. Oxygen becomes toxic and nitrogen produces an anesthetic effect known as nitrogen narcosis—both clearly not ideal for divers. To get around the problem, helium is introduced into the mixture, either with just oxygen to create Heliox, or with both oxygen and nitrogen to make Trimix. One problem of using helium, apart from making divers’ voices go funny, is the size of its bubbles. Helium has one of the smallest molecules of any element, and can easily penetrate inside watch cases. As divers returned to the surface and the pressure on them decreased, the helium bubbles would expand and, with nowhere else to go, would pop the crystals off the watch face, escaping along the path of least resistance. To allow for the gas to leave the watch before that happened, Rolex developed a one-way regulator, set into the case at the nine o’clock position. The HEV, or Helium Escape Valve, was originally trialed on the ref. 5513 Submariner, making it the ref. 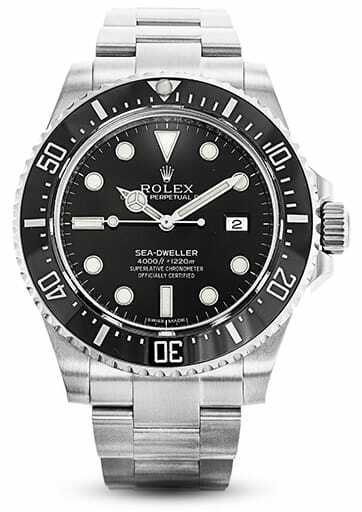 5514, and proved effective enough that it led onto the production in 1967 of the first Sea-Dweller, the ref. 1665. More affectionately known as the Double Red, or the DRSD, for the two lines of red writing on its dial, it was rated down to 2,000ft, far outstripping the Submariner’s abilities. Now massively collectable, DRSDs change hands for huge sums, especially the early pieces, and mark the start of a highly successful run of models still going strong today. However, it was something the Sea-Dweller didn’t have that gained it much of its fan base. Since the ref. 1680 from 1969, the Submariner has always included a Cyclops over its date window. While useful, many have complained it spoils the overall balance of the dial. Although the Sea-Dweller has always had a date function, because of the depths it was designed for, it was impossible to fit it with the magnifying lens, as the pressures on it would have caused it to break. It was therefore the choice for those who appreciated a little extra symmetry in their dive watches. The Sea-Dweller continued on its merry way for 40 years, never selling in as great a number as the Sub, but earning itself a reputation as the cool, more exclusive outsider because of it. Over the years the HEV got bigger, sapphire crystals were fitted and the depth rating doubled, now good for a plunge down to 4,000ft. Calibers came and went—the Cal. 1575 from the original was replaced with the Cal. 3035 in 1978’s ref. 16660 which introduced the high beat 28,800vph frequency of all modern Rolexes, and upgraded again in 1988 with the Cal. 3135 in the ref. 16600. Then, in a move no one expected, and one that caused much wailing and gnashing of teeth, Rolex binned the Sea-Dweller altogether in 2008 to clear the decks for their new brainchild, the ridiculously tough Sea-Dweller Deepsea. A masterpiece of watchmaking brilliance or not, with its unique architecture rating it safe down to 12,800ft, the Deepsea wasn’t able to capture the imagination as well as its stable mates, and six years later in 2014, the Sea-Dweller 4000 made a triumphant return. The ref. 116600 was the first in the Sea-Dweller range to sport the brand’s recently patented Cerachrom bezel, a near indestructible ceramic material that resists fading and scratches, no matter how hard a life it has. It also debuted the Maxi dial, with fatter hands and larger hour indexes to aid legibility. And its bracelet was given the extremely practical Glidelock extension system that allows for fine adjustments to its length without the need for tools. However, as convenient as these additions were, there is another reason the ref. 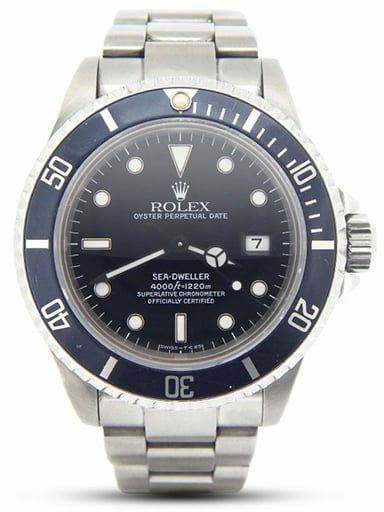 116600 has become the darling of the pre-owned Sea-Dweller market. It was the last reference to be made without a Cyclops lens over its date window. What a difference a small bubble makes. The Cyclops lens was introduced back in 1954 on the Datejust and now sits over every date window in the Rolex range, with just one exception. The Deepsea, designed to carry on working more than two miles underwater, currently has the only non-magnified dial. With a potential five tons of pressure per square inch to contend with, there is simply too much force pressing down on the crystal for the lens to survive. On the Sea-Dweller though, Rolex have found a way to make it work, and managed to upset a proportion of their fans in the process. A trademark element or not, the Cyclops has always spilt opinion, and those who have consistently picked the Sea-Dweller over the Sub for its very lack of the lens are now somewhat lost. The Deepsea is a big watch to be wearing all day, and is missing the essential versatility shared by most of Rolex’s sports models. Given the choice between it and the previous generation Sea-Dweller, more and more fans are deciding to go vintage. That is something of a shame as the latest ref. 126600 is a bit of a stunner. While adding 3mm to the diameter doesn’t sound much of a bump, it makes a world of difference. It has given the watch more presence, but Rolex have managed to hit a perfect balance with it. The other elements have grown in proportion, so the hands, bezel, indexes and bracelet are bigger, but subtly, not in ways that draw too much attention. The case has been intelligently redesigned too, with shorter and more curved lugs so it still suits smaller wrists. It is more comfortable to wear than its predecessor as well, which had a slightly top-heavy aspect that caused a certain amount of wobble. But the best part of the new creation is what has gone on inside. Replacing around 90% of the parts from the previous caliber, the Cal. 3135, commonly regarded as one of the best movements ever made, the Cal. 3235 is a true next generation mechanism, protected by 14 patents. Along with a new rotor, winding system and gear train, it also features a new barrel and high capacity mainspring that gives a power reserve of 70 hours. But the most hard work has gone into a completely restructured escapement, called the Chronergy. With pallet fork teeth half the thickness of before and a skeletonized escape wheel, the efficiency has been increased by 15% and it is now even more resistant to the effects of magnetism thanks to the components being constructed from a nickel-phosphorous alloy. So, should you go for the latest 43mm version or track down a vintage piece in 40mm? There is, of course, no right answer. The contemporary model is the most technically proficient, as you’d expect, and is more in keeping with modern tastes size-wise. Delving into the archive, there are some beloved classics to choose from, with nicknames that make collectors’ eyes light up—the Triple Six, the Great White and, if your pockets are deep enough, the Double Red itself. It all comes down to personal taste (and possibly how good your eyesight is, where the Cyclops is concerned) but it is comforting to know that you can’t really make a bad choice. Whatever its size, the Sea-Dweller is still one of the very best.